Serbian sniper fire and a Bosnian hit man combined to deliver a Balkan battering to send Manchester City through to their third ‘League Cup’ semi-final in the past five years. The Foxes of Leicester City found themselves on the run from Manuel Pellegrini’s pack of hunting hounds who, with a best in class ‘Crufts-like’ performance, dispatched the Championship contenders in a one-sided Quarter Final at the King Power Stadium. Even with eight changes from the 6-3 win over Arsenal, Manchester simply oozed flair and fluency as they built a 3-0 lead before easing off and cantering to a 3-1 victory. The City boss surprised many by fielding prominent players such as Vincent Kompany, David Silva and Pablo Zabaleta from the start, albeit the latter limped off with a hamstring pull troubling the tenacious Argentine national team captain. Zabaleta’s injury, coming so quickly after the news that fellow countryman Sergio Aguero could be missing from City’s line-up for up to two months, means Pellegrini has real injury concerns, but City were alright on the night with a slick display and convincing win. Sharpshooting City have now scored an incredible 75 goals this season and it’s not even Christmas! Aleksander Kolarov adjusted his rangefinder before powering in goal number 73 in the eighth minute. There are few players in world football with a sweeter left foot than ‘AK47’ when it comes to striking a dead ball. Kolarov injected plenty of life into his 30 yard strike as it flew past former City keeper Kasper Schmeichel to get the party started. It was Kolarov’s second goal inside a week following his penalty against Bayern Munich, as City pretty much carried on where they’d left off against the Bundesliga and Premier League leaders. Pellegrini is now regularly achieving his stated objective of ‘Never mind the players – look at how we play’ as City continued with an expansive, one-touch, attacking format which leaves opponents leaden-footed. David Silva, Jesus Navas and James Milner were among the finest exponents of the ‘give-and-go’ approach, with even the much maligned Javi Garcia and Edin Dzeko playing a full part. Dzeko played several deft passes in some classy City build ups and, once again massaged his goals-to-games ratio with two well taken opportunities which even raised a grin and a clenched fist salute from the oft grim-faced forward. Great emphasis has been attached to Dzeko being a ‘confidence’ player, so who knows, with Sergio sidelined and goals flowing, could City be about to witness a resurgent Edin in the vital coming matches? Certainly not shot shy on the night, the familiar ‘EDIN DZEK-OOO-OOOOO’ strains rang out in the 41st minute from the heavy away support, in a nigh on capacity crowd. He’d already tested Schmeichel on two occasions before heading home a well flighted assist from the ever lively Milner. It was the same combination that put the game out of Leicester’s sight eight minutes into the second half. Milner took possession from a Kolarov throw-in and pulled a simple pass back from the by-line, enabling Dzeko to send a decisive side foot shot into Schmeichel’s net. Milner himself has suddenly hit a purple patch in the last three games, comprising two starts and a sub’s appearance. The winner against Bayern, two penalties won and three assists is a superb return for the likeable Yorkshireman, revered for his work rate, but not always accorded the acclaim deserving of his efforts. With no Yaya or Fernandinho in midfield, Jack Rodwell was given a full 90-minutes and he didn’t disappoint. Similarly Silva, absolutely did not disappoint, but was wisely substituted after 70 minutes. Silva is producing his finest football since 2011 and is a huge differentiator for City in every game. Likewise, Samir Nasri is back to the peak of his powers, thankfully now in City colours and not the red and white of Arsenal. What stood out when the Frenchman replaced the Spaniard was the huge beaming smiles exchanged between the two players. Pellegrini has a whole load of ‘happy campers’ at the Etihad and, as much as I liked and supported ‘Bobby Manc’, the upturn in morale is palpable. It is reflected in the brand of football now being played and commensurate with the recognition – some of it begrudgingly – being bestowed on this City side. Even players who could have a reason to feel ‘unhappy’ such as Joe Hart and Joleon Lescott, came in and did their jobs in a thoroughly professional fashion. The England keeper had very little opportunity to shine and stake his claim for a return to PL first team action against Fulham, such was City’s dominance. When he was beaten by Lloyd Dyer’s 77th minute close range shot, it owed everything to a wicked deflection off Vincent Kompany. It always feels wrong to have to write caveats for any goals conceded by Hart since he lost his place to Costel Pantilimon, but somehow necessary to exonerate him of any blame. Pants hasn’t committed any high profile ‘howlers’ during his seven game run in the PL, but I reiterate once again, Hart IS the better keeper, and maybe Manuel should place his trust in him one more time, before pursuing any long term replacement. By all means recruit top quality competition – Iker Casillas is once again being mentioned – but how the hell can City hope to retain two top international keepers, keen to serve both club and country? Who knows who will be City’s keeper when the two-legged Capital One Cup semi-final dawns in January, but no matter who it is you can be sure Pellegrini wants clean sheets and a Wembley final appearance – neigh – Wembley win. It was no way Jose last night as Sunderland dimmed Chelsea’s lights in their QF, whereas tonight presents opportunities for Manure, Mark Hughes’ Stoke, an AVP45-less Spurs and West Ham to join City in the semis. Whoever draws the Sky Blues will be in for a stiff task. Job done! Looking forward to the draw. I think we'd all like to get a double header against Man U. If only because it's warmer than Sunderland. 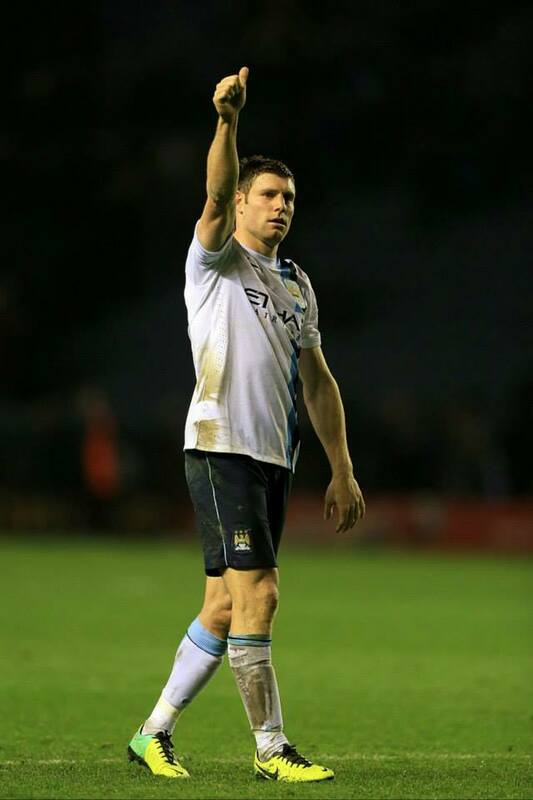 Milner tremendous again, bad news about Aguero (up to 8 weeks) and Zaba's injury doesn't look promising. Have you any news of Jovetic? Apparently he was fit? Onwards and upwards now. 3 Points by the Thames on Saturday and then see if The Norf/Sarf London Derby opens our way to the summit next Monday, It would be excellent to start 2014 looking down and 9 points over Christmas would guarantee us safety from relegation. 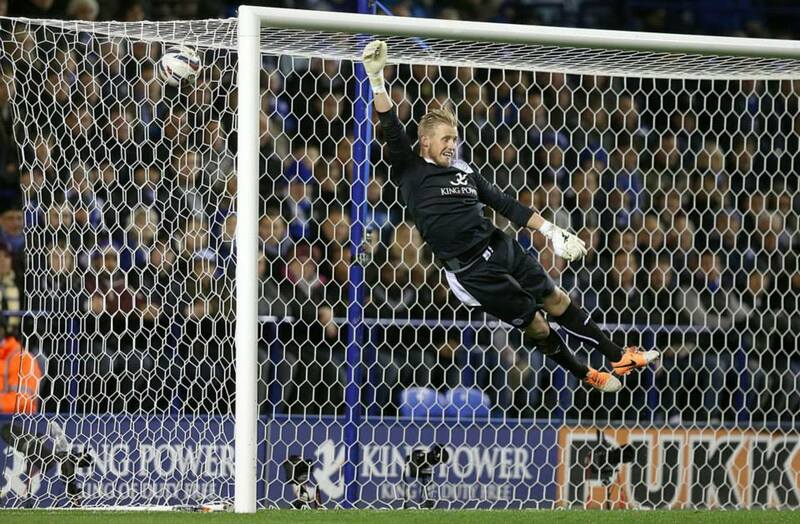 Excellent picture of Schmeichel by the way, He looks like he's about to fall off a zip wire. My concern this month is Liverpool at the Etihad on Boxing Day night. The loss of Sergio and Zaba is a worry but we should, if we play to our abilities be able to beat them and make our way to the top of the table. However, we must not allow any complacency against Fulham, Palace or Swansea. Jovetic apparantly fell ill an hour before Leicester and will hopefully figure at Fulham. It will be very timely if he can hit the ground running with Sergio facing up to 8 weeks out. Jovetic, is really a concern, Rodwell gets more game time? Great write up David. Both nned to shed their Sicknote tags. Both are talented enough players and we need them to step up, especially during times of 'crisis' e.g. injury pile ups. Cheers Dave. Super win, marred by the injury to Zabaleta, and the non-appearance of Jovetic. Let's take that Final step onwards now, and it'll be interesting to see who we draw later tonight. The right back position is certainly something that will give Pellegrini a puzzle to solve for Fulham on Saturday. Bloody injuries! Right back options would be Boyata even Milner at a push - not great. That said surely to goodness we can take Fulham? Great display last night by the guys Dezko in the looked a happy man last night maybe MP has put his arm round him & had a word. The Injury to Zaba is a blow is Sergio's i would put Milner at right back im sure he has played there before for some of his other clubs. All in all thou a good result lets see who we get in the semi's. Maybe Sergio's injury will give Dezko or Jovetic a chance to shine. Great article again Dave i thank you o great one. 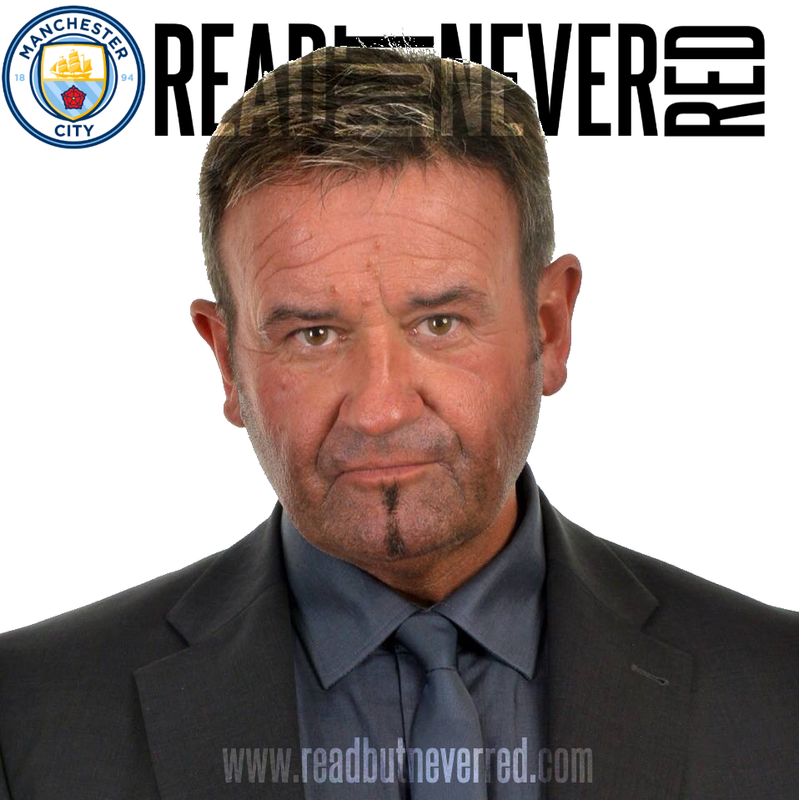 Thanks Doug #MCFCBLUEBROS! Yes, Jovetic & Dzeko could step up in Aguero's absence #BalkanBoys! 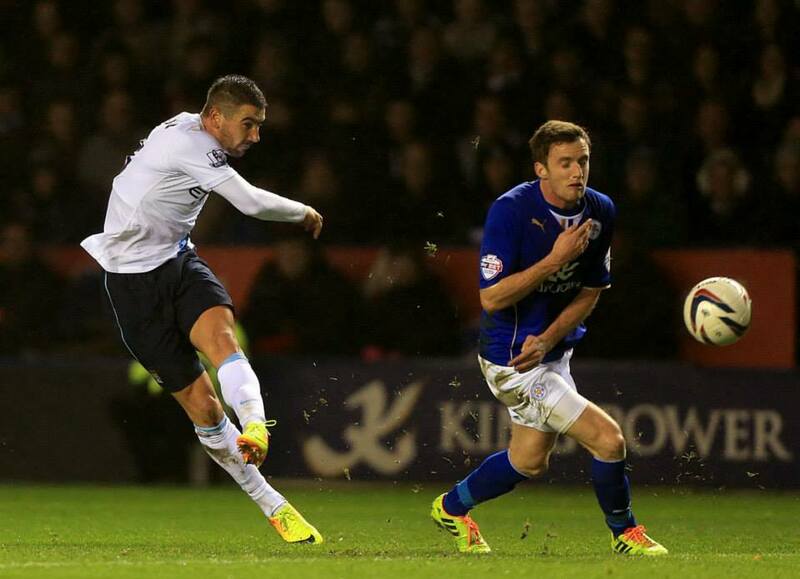 Beautiful goal by Kolarov and loved the picture of Schmeichel grasping fresh air. I think MP will trust Milner with right back duties, if only for the attacking options it it will provide. Pleased with drawing West Ham, need a good lead from the first leg, then see what happens from there. City have a great squad, time for Jovetic, etc., to cover the cracks left by Aguero and Zaba's injuries. All in all, another good week in the Blue Kingdom. Yes indeed Carl - maybe top tonight if Cardiff can do Liverpool some damage?